I am currently in Chicago and the whole family is buzzing with preparations as we get ready to celebrate my little brother’s upcoming wedding. In fact, I had previously thought that we would be too busy to participate in French Fridays with Dorie this week, but then we had one surprisingly quiet evening, and my husband and I volunteered to cook dinner for the family. 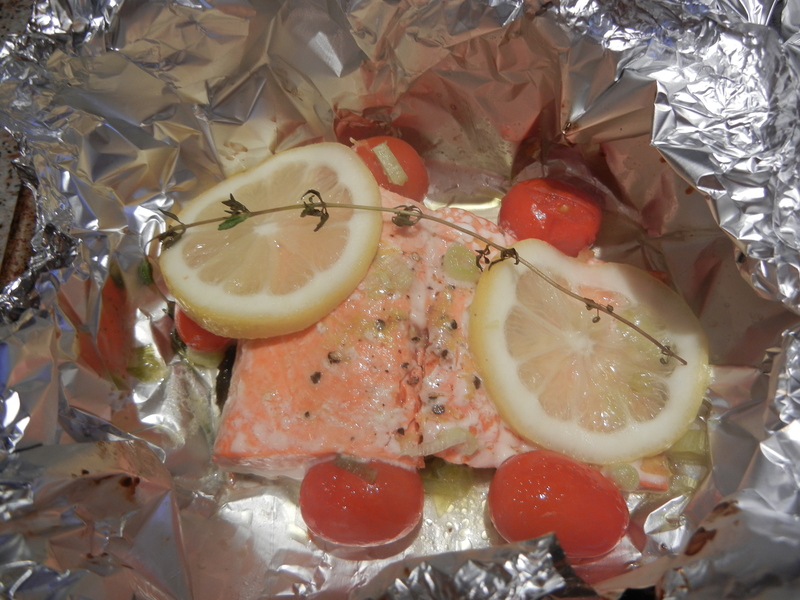 So, with my father snapping pictures, we made Dorie’s Salmon & Tomatoes en Papillote. En papillote means that the fish is cooked in a little individual aluminum foil purse, which has been sealed up with a little oil & seasonings. I admit that I have tried this method before without success. I don’t know what I am doing wrong, but my fish never seems to cook in the given time. In fact, last time I tried this in my apartment in Germany, my fish came out looking more like sushi. With Dorie’s recipe I also found the fish undercooked after the given time (and I am usually one who likes my fish barely cooked) but we popped it back in the oven for a few minutes more and that seemed to do the trick. My father was wondering if this had anything to do with which side of the foil was facing out, does anyone else have any experience with this? But in the end, with just a little more cooking time we sat down to a delicious piece of fish. The salmon was beautiful to look at and, more importantly, very tasty! We will definitely be cooking this one again. This entry was posted in french fridays with dorie and tagged Around my French Table, fish, main course. Bookmark the permalink. You could always do an experiment with two pieces, so that each is sitting on a different side of the foil, and see if one cooks differently from the other. I have no idea if that would make a difference. I always just cough timing variations up to differences in the stove + thickness of the fish, etc. Better to be undercooked than overcooked, because you can always fix undercooked! Good job rescuing your dish. And congrats on your brothers wedding. Enjoy! Congrats on the upcoming family wedding. Enjoy. 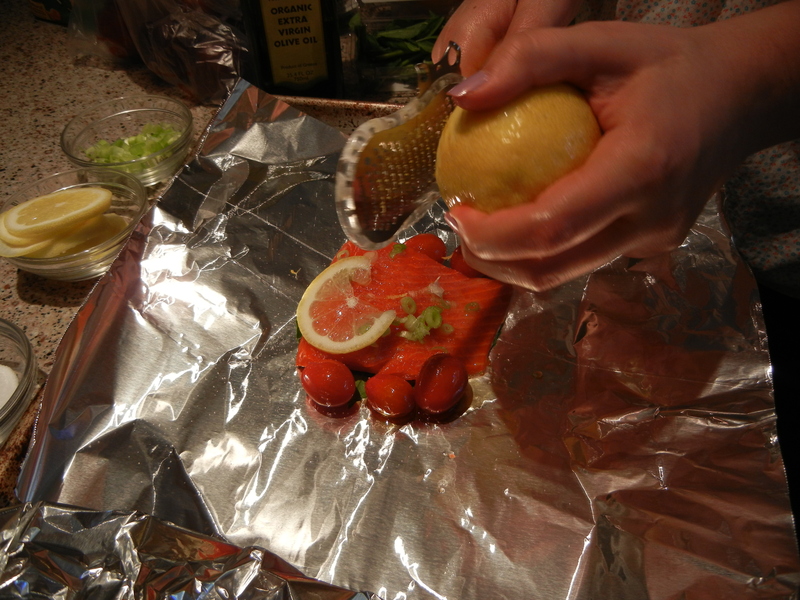 The side of foil shouldn’t matter – it just may be a factor of the thickness of the fish (also, it may depend on the guage of the foil you are using – I have noticed that it takes a little longer when I use a heavier duty foil than when I use a standard foil). How great for your family to step up and help you with the different aspects of Dorie-blogging. I recall hearing years ago that whenever one cooks with foil, the opaque side should be outside, the shiny towards the food. I agree with Adriana, the shiny side out can reflect some of the heat. It shouldn’t make that much of a difference, though. I’m glad you were able to share this dish with your family and that it came out all right in the end.